Introduction: Intracisternal blood injection is the most common applied experimental subarachoid bleeding technique in rabbits. The model comprises examiner-dependent variables and does not closely represent the human pathophysiological sequelae of ruptured cerebral aneurysm. The degree of achieved delayed cerebral vasospasm (DCVS) in this model is often mild. The aim of this study was to characterize and evaluate the feasibility of a clinically more relevant experimental SAH in vivo model. SAH was performed by arterial blood shunting from the subclavian artery into the great cerebral cistern. A total of five experiments were performed. Intracranial pressure (ICP), arterial blood pressure, heart rate, arterial blood gas analysis, and neurological status were monitored throughout the experiments. 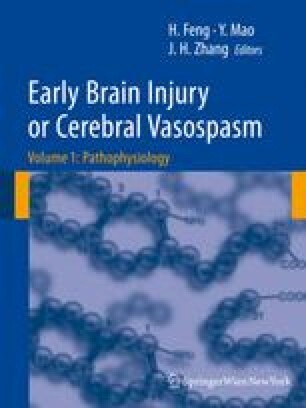 SAH induced vasoconstriction of the basilar artery was 52.1±3.4% on day 3 compared to baseline (P<0.05). Post-mortem gross examination of the brain showed massive blood clot accumulation around the brainstem and ventral surface of the brain. The novel technique offers an examiner independent SAH induction and triggers high degrees of delayed cerebral vasospasm. The severity of vasospasm attained offers a unique opportunity to evaluate future therapeutic treatment options. This study was supported by the Department of Intensive Care Medicine, Inselspital, University of Bern, Bern, Switzerland and the Research Fund from the Cantonal Hospital Aarau, Aarau, Switzerland. We express our gratitude to Hans-Ruedi Widmer, PhD and Angelique Ducray, PhD, Department of Neurosurgery, University Hospital and University of Bern, Bern, Switzerland for their technical laboratory support. We thank Daniel Mettler, D.V.M., Max Müller, D.V.M., Mr. Daniel Zalokar, and Olgica Beslac, Experimental Surgical Institute, Department of Clinical Research, University Hospital Bern, Bern, Switzerland for their skilful management of animal care, anaesthesia, and operative assistance.